Two-thirds of the world’s adult illiterates are women. Literacy is crucial for promoting women’s rights, achieving empowerment, enhancing livelihood skills, strengthening their participation and leadership in the public sphere, and ensuring gender justice. The Sustainable Development Goals (SDGs) adopted by the United Nations in September 2015, state under Goal 4: “to ensure inclusive and equitable quality education and promote lifelong learning opportunities for all”. The performance of India with regard to literacy rate in the developing world is relatively poor. There are rural‐urban differences, gender gaps and regional variations across states in terms of literacy rate. To address the phenomenon of adult illiteracy, timely and adequate policy intervention is a necessary condition. In the Indian context, most of the policy emphasis was on literacy through formal schooling only. The complementary nature of informal adult education programmes never attracted policy attention. However, since the mid-1970s, policy initiatives took place in the form of the National Adult Education Programme in 1978. The most recent policy endeavour has been the Saakshar Bharat Mission, a centrally sponsored scheme launched in 2009 to promote and strengthen adult education with particular focus on women. Unfortunately, policy makers have given little attention to the social processes associated with literacy learning and development. There is a need of a wider lens on literacy in order to explore not only ‘what works’ in practical terms of encouraging women to participate in programmes, but also to look at the ‘why and how’ literacy programmes can contribute to sustainable development and the processes of empowerment. 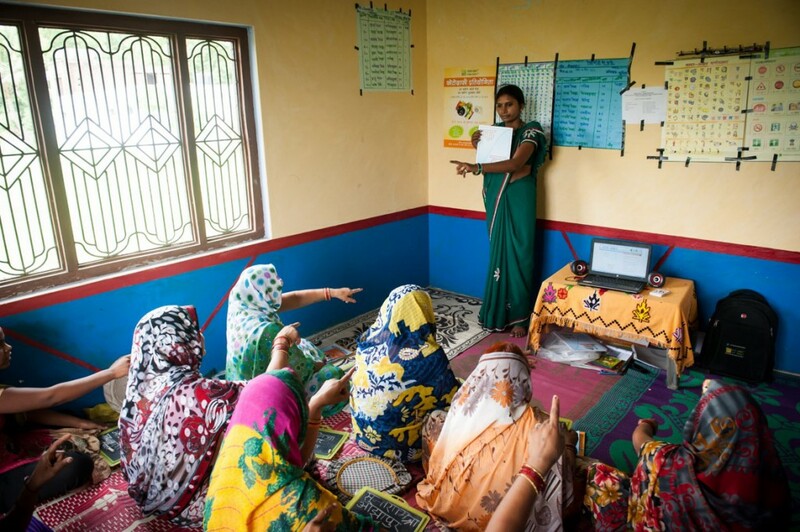 This has been clearly observed in the work done by Development Alternatives through its literacy initiative (TARA Akshar programme – a two month computer based literacy programme, followed by a six month post literacy initiative), where neo literate women were able to show a remarkable difference in levels of participation (both socio-political and economic). External agencies conducting the impact analysis of the programme have shown that in case of ‘themajority of participants, there was a change in the mindset regarding the importance of education (for boys, but more so for girls) and relatedly, the importance of delaying marriage until education is completed was also now in their thought process. For younger children, women mentioned that now they are able to pay more attention to their homework and attendance’. Develop appropriate strategies and institutional mechanisms to reach out to adult female illiterates. Consider additional premium allocation for literacy programmes that focus on reaching out to women learners (in view of the multiple barriers faced by women) to make them and their families interested and engaged in the learning process. Several similar initiatives, including TARA Akshar programme’s experience on ground, have shown that when the mobilisation process is “inclusive”, (i.e. it includes families and communities), the availability of women for the programme substantially improves. Incorporate modules on women’s rights, gender sensitivity, reproductive health, family life and women’s participation in community affairs, in adult literacy and learning programmes. Productivity at the household front is expected to be impacted through changes in health, hygiene and educational choices. Integrate the linkages of literacy to livelihood in the literacy initiatives more strategically. The experience of TARA Akshar programme has shown that women (and more specifically their families) want to see the immediate and tangible effect of literacy (which in most cases is expected to be the enhancement of income). As a result of this finding, the incorporation of vocational training in literacy initiatives is seen to be serving as a “hook” to attract illiterate women and sustain their participation. According to the evaluation studies, besides an increase in cognitive skills (numeracy and literacy) and factual knowledge, there was an increase in non-cognitive skills and mobility among the neo-literates. Literacy policy needs to start from a more holistic perspective on development interventions, so as to maximise cross-sectoral interaction and support from the outset. Through research, the contextualised understanding to inform decisions on pertinent aspects (like which literacy teaching approach to be adopted; whether to target a specific group of women, or women and men more generally; how to challenge existing forms of gender oppression; and what other kind of legal, financial, organisational and skill development support may be required) needs to be studied and explored to finalise the operational aspects of the literacy policy. A transformative approach to the empowerment of women needs to be developed, particularly in relation to the social equality paradigm. As the resourcing of literacy programmes is the greatest obstacle, the importance of literacy in sustainable development and the empowerment of women should be explicitly recognised within the post-2015 Education for All goals, as a first step towards mobilising adequate resources for adult education and lifelong learning. National governments and international donor agencies should prioritise greater budget allocation to adult literacy programmes and the literacy components of sustainable development programmes; and the International agencies should mobilise private companies to develop partnerships with national adult literacy programme for improving access to new technology and funding streams. The results of all the above interventions can be extensive and far-reaching.